In the environment we are subjected to today, it is impossible to keep up with the amount of toxins we are exposed to on a daily bases. 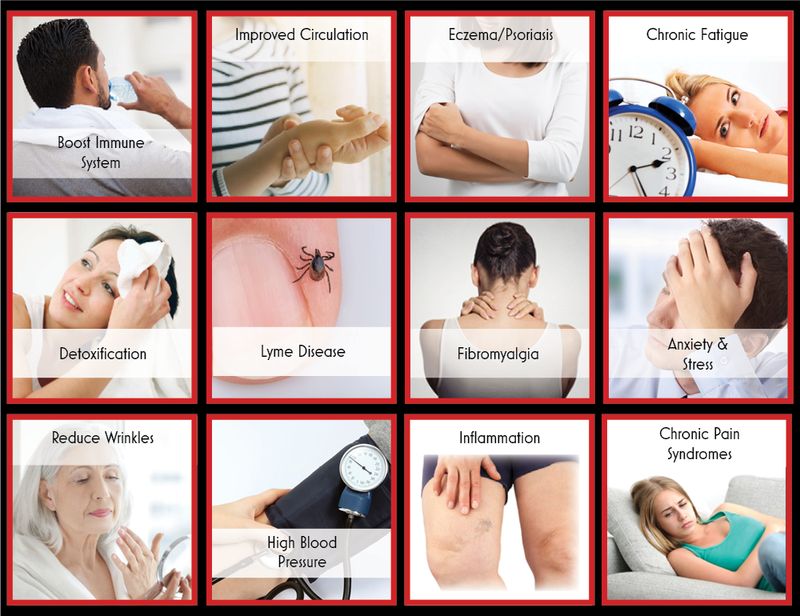 Many common ailments have been linked to a buildup of these toxins, which interferes with how our body operates down to the cellular level. Our infrared heat therapy can efficiently heat the body by raising core body temperature to produce a deep, detoxifying sweat, at the cellular level, where the majority of toxins reside. Not only are toxins leaving your body, but infrared therapy helps improve circulation, repair damaged tissue, aid in muscle relaxation and pain relief. Sweat detoxing can also benefit your overall health, including less stress, better sleep, increased relaxation, improved appearance of skin, and weight loss. During a session at BodyWorks & Laser Clinic, you sit comfortably in the unit and relax, while the infrared light heats your body. The therapy lasts for approximately 40-minutes and during this time, the infrared light waves travel deep raising your body’s core temperature, increasing soft tissue elasticity, stimulating blood flow, removing toxins, relieving pain, reducing stress, and encouraging muscle relaxation. Our infrared unit is the only one on the market with the Solocarbon 3-in-1 heater, which is clinically shown to effectively administer three wavelengths; near, mid, and far. Proven 99% efficient across all wavelengths for optimal health benefits. Because the various wavelengths operate independently, we can program them to precisely target your health goals. Near infrared (NIR) is the shortest wavelength and penetrates the skin’s surface more effectively than the other two. NIR promotes cell health, wound healing, and tissue growth. Mid infrared (MIR) is a longer wavelength that can penetrate deeper into the body’s soft tissue where inflammation occurs. MIR helps expand blood vessels and increases circulation, so more oxygen can reach injured areas of the body. This reduces pain and speeds the healing process. Starts at a high intensity increasing the body’s core temperature then reduces to a low, comfortable intensity level. IR combination improves vascular access flow to reach toxins at the cellular level. Solocarbon heaters are not only the most effective far infrared heater on the market, they are also the safest. Our sauna has met the strictest safety standards for more than a decade. Our patented heater design has a 95-99% emissivity rating and cancels out EMF to levels that are virtually undetectable-less than 1mG. 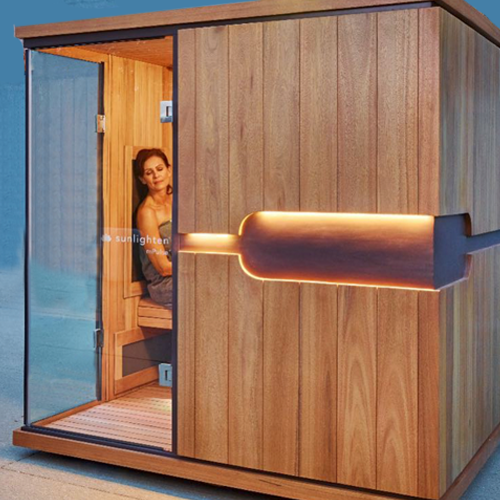 Our sauna has been tested and approved by numerous safety agencies and are ETL-certified. 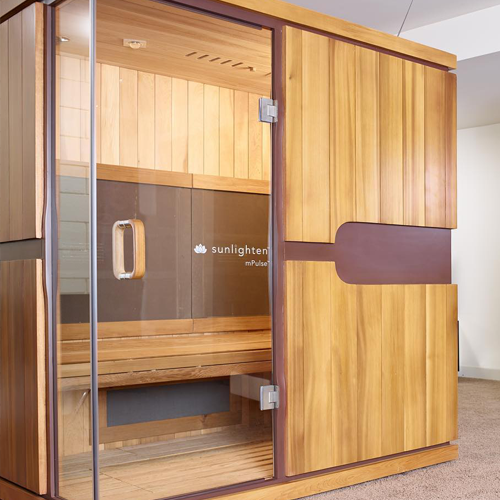 Unlike traditional saunas our Infrared Heat Therapy Unit is the only far infrared heater on the market clinically backed and proven to raise core temperature, lower blood pressure, and aid in weight loss, rather than simply heating the air around you. 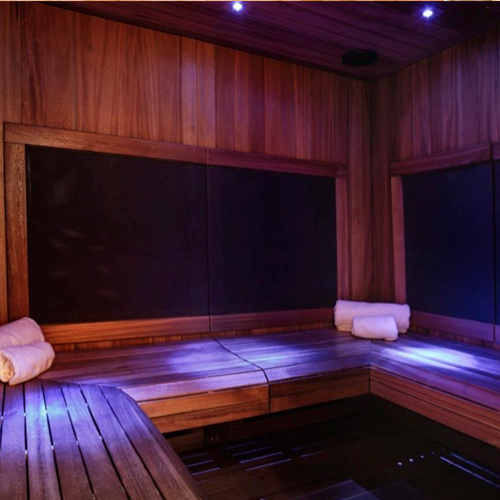 Traditional saunas warm the environment around you at extremely high temperatures, which can make the experience unbearably hot and difficult to breathe. 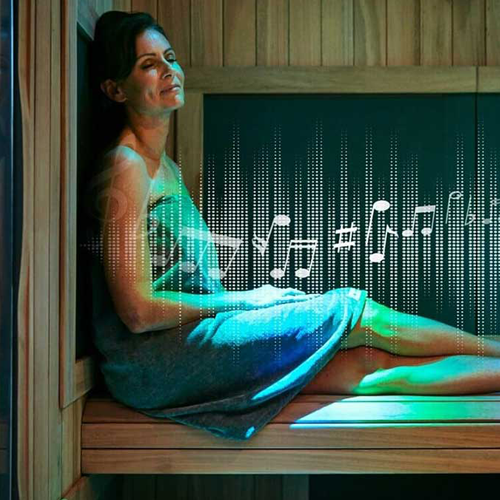 Because infrared heat penetrates human tissue versus simply heating the surface of the skin, infrared saunas are SEVEN TIMES more effective than a traditional sauna at detoxifying the body, producing a sweat composed of 20% toxins versus only 3% toxins. Our Infrared Heat Unit is the most recommended by doctors, health professionals, and wellness experts. It is recognized by the American Heart Association for reducing blood pressure and heart health, American Cancer Society, and National Autism Association for detoxification of lead and cadmium; toxins which can cause symptoms to worsen for individuals with autism. What is Chromotherapy? Our bodies need the sun’s light to live, and that light can be broken down into a seven color spectrum. An imbalance of any of these colors can manifest itself into physical and mental symptoms. 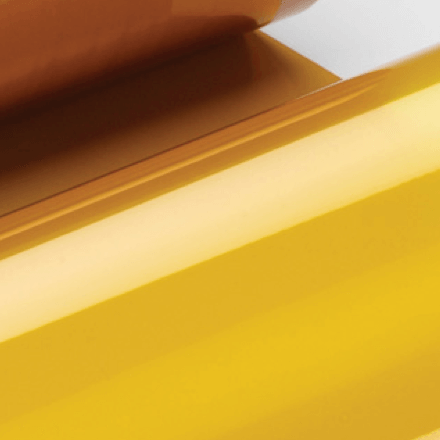 Chromotherapy works on various energy points to help balance your body via the full spectrum of visible light, each color of which addresses a distinct need. Each color possesses frequencies of a specific vibration, and each vibration is related to different physical symptoms. 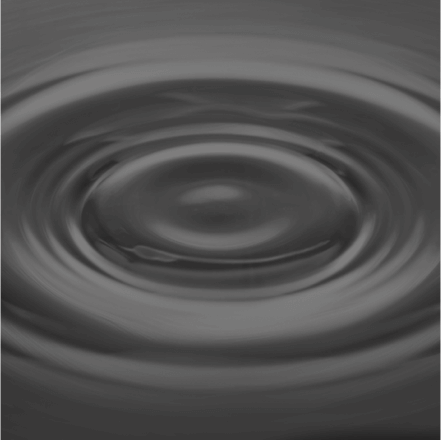 Acoustic Resonance Therapy creates an environment for the body to experience the benefits of sound and vibrational healing by stimulating our sense of feeling. It combines the healing effects of sound and vibration to harmonize all systems of the body bringing you to a deeper state of relaxation. An amplified audio signal resonates sound waves to the surface of the unit. Listening to soothing music and feeling it resonate throughout the body stimulates the body’s natural relaxation response. It feels like a light touch massage during your session. Infrared therapy generates a sweat 7x mores detoxifying than a traditional sauna. Our Solocarbon heaters have been clinically shown to reduce both systolic and diastolic blood pressure. Researchers have found therapeutic benefits to back, neck, and arthritis pain from continuous use of infrared heat therapy. Our advanced LED near infrared technology has the unique ability to heal wounds faster and minimalize scarring. 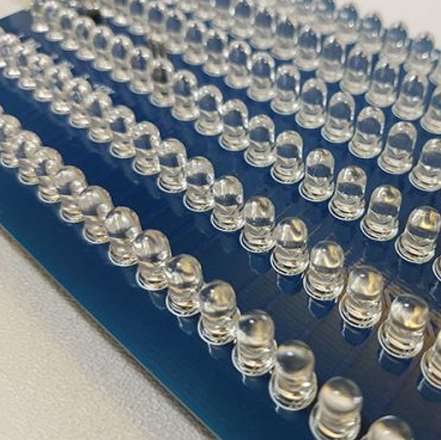 Stay healthy with the natural preventative properties of our exclusive LED near infrared heating technology, which aids in cell health, muscle recovery, and overall immunity defense. Studies have shown a 30-minute infrared session can burn up to 600-calories. Our unit has been designed to encourage the purest form of relaxation and stress-reduction. IS IT OKAY TO USE THE SAUNA WHILE BREASTFEEDING? Please consult with your physician, as this answer is usually yes, but may be no depending upon specific circumstances. HOW OFTEN CAN I DO A SESSION? Most people partake in a 40-minute session, 3-4 times a week, but it is safe to use daily. 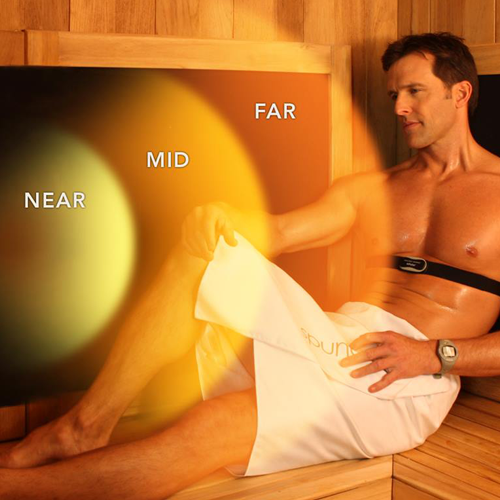 SHOULD I BE CONCERNED WITH THE OUTPUT OF ELECTROMAGNETIC FIELD FROM INFRARED HEAT THERAPY? No, the EMF (electric and magnetic field) levels of our infrared heat therapy is well below the threshold of what is generally considered safe. In fact, our therapy produces less EMF than a standard hair dryer, or cell phone. 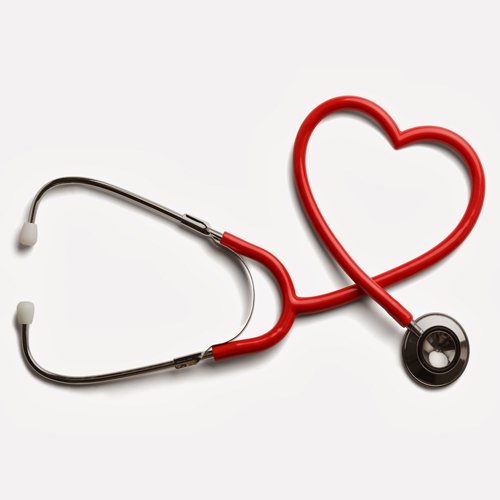 If you are pregnant, have had an organ transplant, or have a pacemaker we advice that you consult with your physician. Metal pins, rods, artificial joints or any other surgical implants generally reflect infrared waves and thus are not heated by this system. Nevertheless, you may consult your physician prior to using an infrared heat therapy. I’M TAKING PRESCRIPTION MEDICATIONS, CAN I DO AN INFRARED HEAT THERAPY SESSION? As with any medical treatments individuals who are using prescription drugs should consult with their physician to ensure there is no risk for drug interaction. Very relaxing – felt like sweat was pouring toxins out of my pores. Sense of calm. Very nice to be warm in the cold weather. Very relaxing. Very relaxing. Staff very friendly & informative. Excellent experience. I was pleasantly surprised by this therapy. It was very relaxing, and I would do it again for all of its many benefits! I usually don’t like hot temperatures but found this to be amazingly relaxing. Felt quite warm in the first few minutes, but my body seemed to adjust and I felt very comfortable. Clean, comfortable environment, wonderful, calming music. Never thought I’d feel so “chilled out” in warm temps! Loved it and great to share with my wife. Great experience! Relaxing. The room was welcoming, clear instructions. Thankful for the opportunity to detox and relax. Would recommend everyone to try this experience. Loved it. Very relaxing. Liked the soothing music. Great for a cold winter day. The infrared therapy was such a great experience! It was the perfect thing to do on a cold snowy day. I loved that I got to try it out with my mom. Thank you for this great opportunity. So so good 🙂 Warm-relaxing-I didn’t want to leave experience. Cannot wait to see results in my everyday. Very calming, felt so good on a winter day. It was very warm, but a wonderful warm. Not too much, but enough to bring peace and calm to my body! A very good experience. Calming, relaxing. Staff was excellent at explanation of infrared unit and benefits. It was very relaxing. I look forward to tomorrow to see how I feel. Very relaxing. Also seemed to relieve some of my foot and ankle pain. It was wonderful, friendly staff. I love how relaxed the infrared sauna is! It definitely gets better each time I come! Mary Kay was awesome to work with. For my first time of doing Infrared Therapy, she made sure I had all questions answered and allowed me to take my time getting ready before beginning. Since moving to Wisconsin and winter starting, I have developed extremely itchy and dry skin. I was desperate for a solution!! 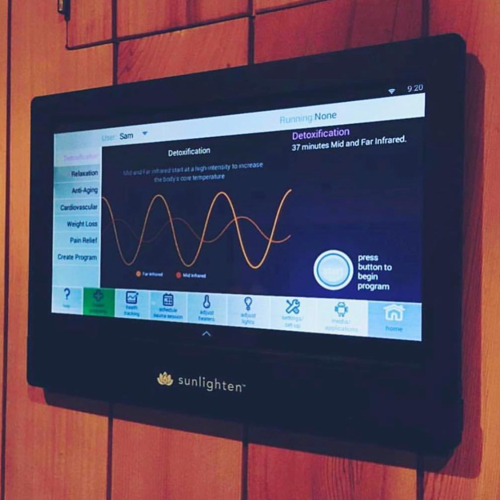 Not only do I experience therapeutic benefits, the infrared sauna is very relaxing – helps in managing my dry skin in these cold temperatures and keeps inflammation at bay. After just one session I noticed a tremendous improvement and will continue weekly infrared therapy sessions. I am so glad the itching is gone! It was obviously very different from the cryotherapy I have been doing. I do have the similar feeling of being energized after the session! I’ll have to see if it also creates the longer term results like cryo does. EXCELLENT! Feel Great. Very Relaxing. Extremely professional, knowledgeable, CLEAN. Will definitely be back. Awesome! Great experience. Beautiful facility. I had an amazing first time experience. Will definitely be back! It was a very different experience. Relaxing and enjoyable I like the heat especially. Soothing. Attentive staff explained everything exquisitely. Felt immediately at ease with the environment BWLC creates. Thank you! Very comfortable – relaxing experience. My muscles are less tired and achy already. My body feels good compared to how it felt coming in. The relaxation session lives up to its name! I’ve been coming in for the cryotherapy and having had good experiences with it was happy the infrared was also good. It was a great warmth that made me relax. I’m hoping it gives me some relief with my lyme disease. Thank You! Very relaxing. I enjoyed how calming it was. Very relaxing. My knee felt better when I came out. Usually if I sit for 15 minutes or longer the pain of getting up is extreme, but today no pain. Very happy that I tried it. Was very relaxing. Will definetly be doing it on a regular bases. Extremely knowledgeable & kind staff. I truly felt relaxed & comfortable during my entire appointment. I’m looking forward to my next visit. Thanks! !